Master the art of Pokémon battling with your favorite Pokémon—one card at a time! The Pokémon TCG: Sun & Moon Trainer Kit—Lycanroc & Alolan Raichu gets you playing from the very first card you draw. And with fun and powerful Pokémon at your side, you'll be a Pokémon Trainer before you know it! This kit contains everything you need to learn, train, and win! Play both decks against each other, then combine them to create one bigger deck where Lycanroc and Alolan Raichu battle side by side! Or test your deck at a Pokémon League near you and in the Pokémon TCG Online! 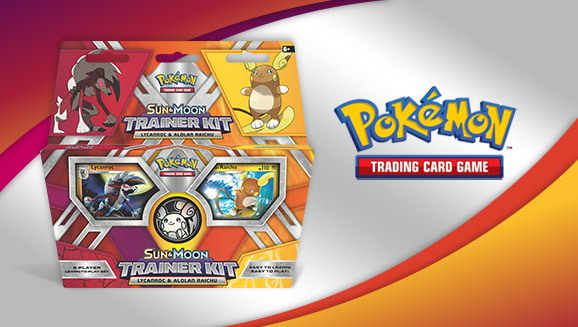 Look for the Pokémon TCG: Sun & Moon Trainer Kit—Lycanroc & Alolan Raichu in the Pokémon Center and where Pokémon TCG products are sold.